Voted "Best Veterinary Clinic in Central Minnesota"
We are a multiple-doctor veterinary practice offering a wide variety of services for all animals, including exotics, birds, reptiles and pocket pets. We have been serving the central Minnesota area since 1951. It is our goal to provide the highest quality standards of care in a warm and friendly environment. We understand that your pet is a part of your family and we consider you to be part of ours. It is our priority to provide the finest medical, surgical, and dental care to our patients. It is our goal to assure that you, the owner, are well informed, involved, and comfortable with the decisions made regarding your pet's care. Using state-of-the art equipment, keeping abreast of advances and technologies, and our kind, caring attitude is what separates us from the rest. At Cold Spring/St. 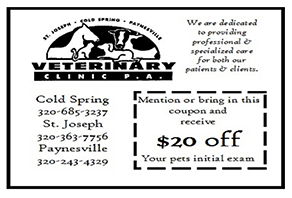 Joseph/Paynesville Veterinary Clinic, we treat your pets like the valued family members they are. Sign-up using the form or call us at 866-900-7756 to take advantage of this exclusive offer.